It’s official. Summer is leaving…being shooed away by gloomy skies and rainy days. Just as with all transitions, it’s a happy-sad time. Sad because I say goodbye to my blindingly gorgeous summer mangoes that can slay a girl with their sweetness. Sad because summer sunshine and beach trips are coming to an end (not that we can’t go to the beach out of the summer season…advantages of living on a tropical archipelago and all). Sad because I already feel the celebratory spirit that only summer can bring (even if you’re all grown up and summer vacation seem to have gone the way of Santa and the tooth fairy) slowly slipping away. Happy because the weather will finally be getting cooler! Happy because there is nothing quite like sipping hot coffee beside a rainy window. Happy in the hope that the electricity bill will return to more respectable levels. Happy because it’s soup and stew season (hello monggo, nilaga, and callos) and I can once again cook long and slow without too much pain. Summer isn’t the only one leaving. I’m off to Spain (!!! ), Barcelona to be exact…one of my very favorite cities in the universe. I won’t be long, just nine days, too short really. But it’s the longest I will have been away from little C since she joined our fledgling family. So this too is happy-sad. Happy because, well, it’s Barcelona (what more needs to be said right?)! Sad because I’ll miss my little cherry bomb’s wild antics and solemn kisses. But I’ll be back before we all know it! Hopefully with a stash of pimenton de la Vera and a Nespresso machine 🙂 And who knows what other goodies! Meanwhile here’s another delicious dish from Heidi Swanson’s Super Natural Every Day (I am just loving this book much too much!). It is what she describes as “the sort of simple dish I find myself enjoying on the most blustery of San Francisco afternoons”. Let me tell you, it does equally well in the Manila rainy season. – Pour olive oil into a large skillet over medium high heat. Add potatoes and a big pinch of salt. Toss, cover, and cook until the potatoes are cooked through, 5-8 minutes. Be sure to scrape the pan and toss the potatoes once or twice along the way so all sides get color. – Stir in the shallot and the beans. Let the beans cook in a single layer for a couple of minutes, until they brown a bit, then scrape and toss again. Cook until the beans are nicely browned and a bit crispy on all sides. 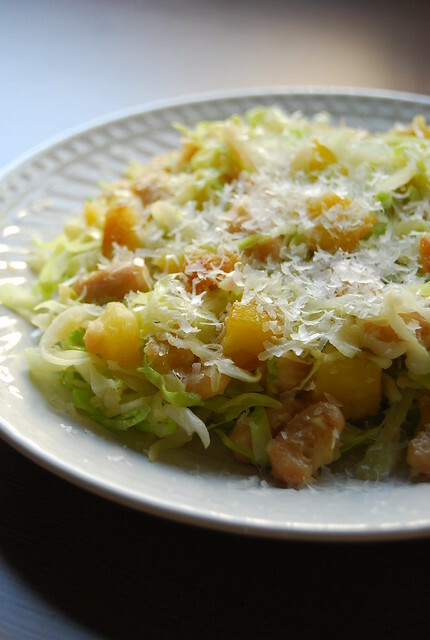 – Stir in the cabbage and cook for another minute, or until the cabbage loses a bit of its structure. Serve dusted with parmesan. I used canned beans for this but I will try making my own next time. The canned ones didn’t seem to brown as enticingly as Heidi’s did in her photo. On the whole though, I loved this dish. It’s a combination of 3 things I like — cabbage, beans, and potatoes — each of these registering very high on the comfort scale. All together, and generously dusted with finely grated parmesan, this is like a slow, warm hug on a rainy night. For now I leave our summer’s end (and the start of our own rainy nights) to head to another summer’s beginning. Although it is still warmer here then over there! See you all when I get back! While I’m away, and if you have absolutely nothing to do, which I am sure is the furthest thing from the truth, but you know, just in case, you can visit me on Pinterest. It’s a “virtual pinboard” of images that I love, or are inspiring to me, for one reason or another. Maybe you’ll find something that inspires you too? 🙂 You can click on the Pinterest link on my right sidebar or HERE. A lovely dish! Very enjoyable. Have a wonderful time in Barcelona. Looking forward to what you bring home and share in your blog. OK Joey this is weird – I'll going to Spain too, Madrid and San Sebastian to be precise… at the end of June!! Good tip about getting the pimenton!! It looks quite delicious. This reminds me that I really need to get hEIDI'S book. So many things to say…LOVE pinterest, love this new blog of yours I've stumbled upon and can't quite believe I haven't made anything from Heidi's book yet. This looks like a good starting point! Have fun in Barcelona, a city I would love to visit. I'm looking forward to what you're going to serve on your table after or during the trip. And our summer is here — at least from the calendar's perspective. It won't get hot until August and September. This dish sounds wonderful. I got Heidi's book, but have only enjoyed a good drool through the recipes. Need to try this! Yum! Can't wait to give this recipe a whirl! Hi Kelly! Well, although the rainy season has started a bit of the summer warmth still lingers and that means humidity! I am enjoying the cooler weather in Spain immensely! I'm completely and utterly jealous of your trip to Spain! It's where I'd like to go on my next big trip, however that probably won't be for some time. I miss your posts on my dashboard! This looks delicious as always. Would love to see more of your recipes soon. Hi Flizbee! I have been wanting to see that movie! Hi Midge! It was a fun trip, albeit so short. And yes the food is amazing! Hi Marvin! I had a blast 🙂 Spain is really awesome…you will love it! When you go be sure to include Barcelona…such an amazing city! Hi Brittany! Thank you 🙂 Hoping to get more posts up soon!